The AP testbed has been running for over two months now. I finally got around to testing the pH of the water. Not good–over 8. I checked the pond in the evening and this might have something to do with the high number. Apparently, pH is lowest in the morning and highest in the evening. I added some vinegar and will check again this evening. I bought some chelated iron to help the plants out, but they won’t be able to absorb it until the pH issue is resolved. Despite the lack of iron, the peppers are beginning to show blossoms. There are lily pads and cattails in the pond, added to give shelter and structure for the fish. There are some unwelcome visitors as well. Mosquitos. The koi don’t seem to be eating the larvae, or aren’t keeping up with them. To help with this, I bought around 40 common goldfish. The purchase came in at $12. Hopefully they’ll curb the mosquito population. There’s another fish in the pond besides the wee goldfish. His name is Fred and he is some sort of black goldfish, with bulgy eyes and lacey fins. He is about 8 inches long and is bigger than the koi. Fred is a friendly gent. He comes up and visits when I stand next to the pond. I’m looking forward to getting a bigger pump to grow the system. Hopefully I’ll have it in place before the fall. 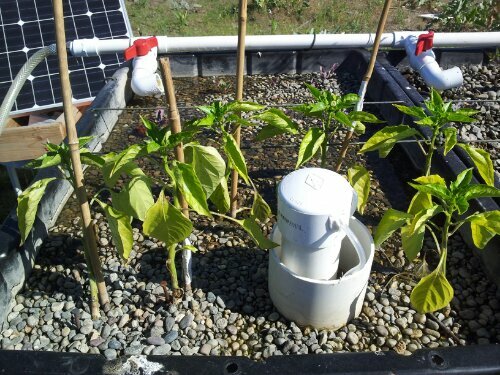 This entry was posted in Aquaponics and tagged chelated iron, mosquitos, pepper, ph by admin. Bookmark the permalink.